As temperatures outside fluctuate, the rising temperatures cause snow on the ground and piled from shoveling and plowing to melt. In the evening when the sun sets and the temperature drops, this melting snow freezes into “black ice” causing a potential hazard for vehicles and pedestrians. The presence of black ice creates unsafe walking conditions as the clear ice that looks dark gray — like a wet sidewalk. This can be hazardous and is a huge threat to slip, trip and fall safety. Similarly, black ice can result in hazardous driving conditions, since the ice is virtually transparent. Driving on black ice is particularly dangerous because the roadway can simply appear wet and drivers therefore do not recognize the slippery conditions until it’s too late. Black ice also is a common occurrence at place of employment including exterior brake areas, near downspouts and parking lot drains and anywhere downhill from piled snow. 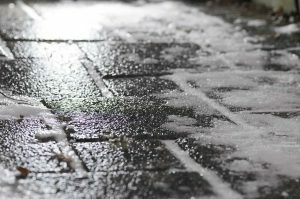 Proper salting and surface treatment practices are required by property owners and employers to alleviate the ice areas that could cause injuries. In the winter, be sure to monitor the outside temperature to determine the potential for black ice. If you, a friend or family member was injured as a result of a slippery ice or snow condition, please contact us to discuss your matter with a trial attorney and determine if you are entitled to compensation.